228 pages | 5 B/W Illus. Rhetorical Realism responds to the surging interest in nonhumans across the humanities by exploring how realist commitments have historically accompanied understandings of rhetoric from antiquity to the present. For a discipline that often defines itself according to human speech and writing, the nonhuman turn poses a number of challenges and opportunities for rhetoric. To date, many of the responses to the nonhuman turn in rhetoric have sought to address rhetoric’s compatibility with new conceptions of materiality. In Rhetorical Realism, Scot Barnett extends this work by transforming it into a new historiographic methodology attuned to the presence and occlusion of things in rhetorical history. 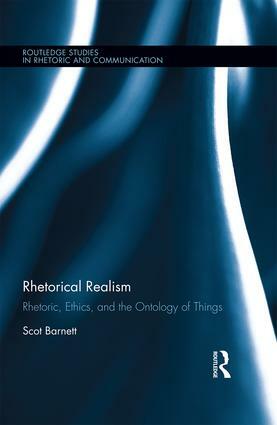 Through investigations of rhetoric’s place in Aristotelian metaphysics, the language invention movement of the seventeenth century, and postmodern conceptions of rhetoric as an epistemic art, Barnett’s study expands the scope of rhetorical inquiry by showing how realist ideas have worked to frame rhetoric’s scope and meanings during key moments in its history. Ultimately, Barnett argues that all versions of rhetoric depend upon some realist assumptions about the world. Rather than conceive of the nonhuman as a dramatic turning point in rhetorical theory, Rhetorical Realism encourages rhetorical theorists to turn another eye toward what rhetoricians have always done—defining and configuring rhetoric within a broader ontology of things. Scot Barnett is Assistant Professor of English at Indiana University-Bloomington, USA where he teaches courses in rhetorical theory and digital rhetoric. With Casey Boyle, he is the editor of Rhetoric, Through Everyday Things (2016). His work has also appeared in the journals Enculturation, Kairos, and Itineration as well as in several edited collections.